Betty Brant, Ned Leeds, Mrs Watson, Aunt May, J. Jonah Jameson, Frederick Foswell, Liz Allen, Flash Thompson and a chorus of police, crooks and cab-drivers. Jameson offers $1,000 reward for catching the Cat Burglar. This is what he pays Peter for fair-to-middling pictures — maybe $7,000 or £5,000 in today's money. Jameson underpays Peter for his pictures, while claiming that he’s being generous because he saved the reward money. This suggests that he is paying Peter a lot less than $1,000 — maybe as little as $250 this time? The action of this story takes place over two consecutive days. Everyone has a rest on the day after the fight with the Scorpion, but Peter Parker goes into action the following evening. p3 “When the apartment’s tenant returns home…” Millionaire J.J.J rents an apartment in Manhattan. He has a home office set up in the flat, and Spider-Man knows its location. You might expect this to be setting up a guest appearance by Iron Man, but you would be wrong. This is a flippant comment: but it illustrates the way Spider-Man thinks. He deserves to beat the baddies because he is a good person, so every defeat is perceived as a cosmic injustice. Spider-Man and Stan Lee get the banter about right this issue: lots of flowery little phrases, but nothing too irritating. p5 “I’m gonna bring you that cat burglar before you can say ‘All the way with J.J.J.’”. This is the first time since Amazing Fantasy #15 that Spider-Man has been shown with pupils in his eyes. "Petey! As I live and breathe! I haven't seen you since graduation." Liz last appeared in issue #28, which by our calculations was about three months ago. This will be her last appearance in the classic era: Gerry Conway exhumes her in issue #132. This frame also makes little sense: why should Peter phone Betty (presumably from a phone booth) after he has already set out to visit her? The word “groovy” became a universal term of approval in the flower power era (usage peaks in 1972). In 1965 it still retained its older 1950s jazz club connotations -- so Peter is saying that his Aunt’s pie was “up to the minute” “fashionable” or “of the moment”. The word “fridge” was certainly in use by 1965, but it hadn’t fully replaced “icebox” as a synonym for refrigerator. So Peter Parker misuses a slightly unfashionable word; his aging Aunt responds with an up-to-the-minute one. Presumably he couldn’t afford the subway because he had spent his last dime on the wholly unnecessary call to Betty from a public booth. Why he should want to take the subway when he can web-swing home in a quarter of the time is a matter for conjecture. Peter Parker has been dumped by his one true love; but Spider-Man regards his fight with the Cat Burglar as a rather enjoyable game. J.J.J thinks in the same way that Peter Parker does. When things turn out well, it’s because he deserves it. "Only the batty Marvel bullpen could present such a truly dazzling display of derring-do as The Claws of the Cat!" You could call issue #30 of the Amazing Spider-Man a lot of things — a soap opera, a film noir, a slice of life — but “a truly dazzling display of derring-do” it really isn’t. Once again, one wonders if Stan Lee had actually read the comic before writing the cover copy. Or is it the “batty Marvel bullpen” who are supposed to be engaging in swashbuckling courage by publishing something so odd? The Claws of the Cat is not really about anything. It is an orphan issue, winding up threads from last month, setting up plots for next month, but not really about anything itself. Like issue #9 it seems to plunge us into the stream of Peter Parker’s life and make no attempt to connect the threads together. Even the cover is weird: our hero is so small you could easily overlook him. A tiny Spider-Man, a tiny man in a green boiler suit on a rope. Way, way down below, tiny police and tiny onlookers shine search lights at the building. We’re observing Spider-Man from a distance. A small figure involved in a small crime. You could be forgiven for thinking that this was the latest issue of The Amazing Collapsing Water Tower. It takes a serious nudge from our old friend "an inscrutable fate" for Spider-Man's life to become entwined with that of this criminal non-entity. The Cat Burglar just happens to burgle the New York apartment of one J. Jonah Jameson and J.J.J. offers $1,000 reward for the thief's capture. So naturally, Peter decides that he is going to capture the Cat and claim the reward --- partly because he could do with the money but mostly because it will annoy Jameson. "Jolting ol’ Jonah is fast becoming my favourite indoor sport”. There is no longer any doubt that the relationship between J.J.J. 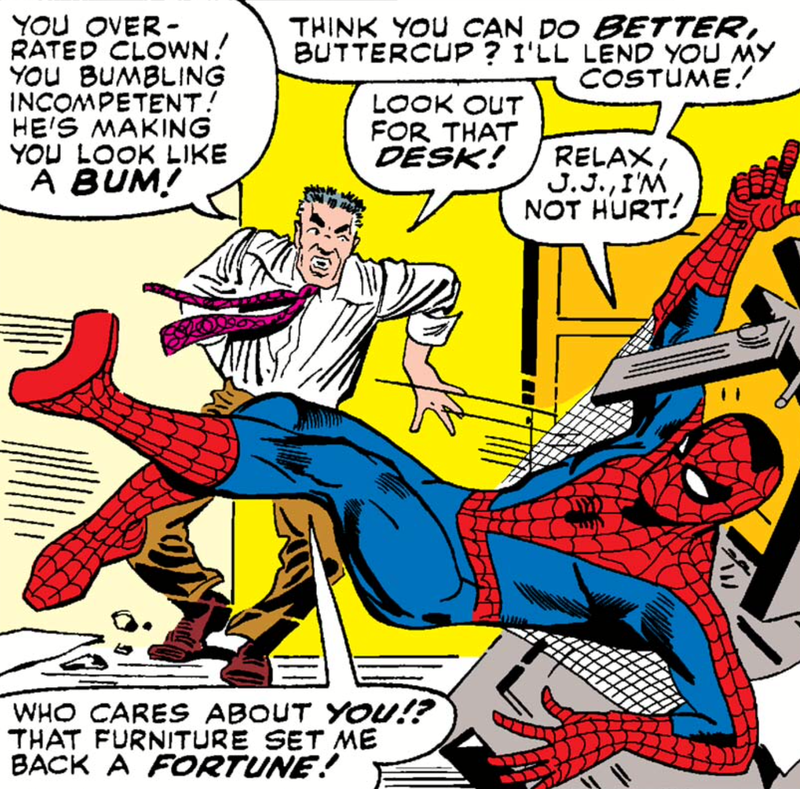 and Peter Parker is one of mutual bullying. The first great cycle of Spider-Man stories is nearly at an end, and Peter Parker is still no altruist. He goes after the Cat for money, and for fun, and as a distraction from his personal troubles. When he accidentally stops a businessman from being murdered by a disgruntled former employee, he is positively disappointed. "Heck! It wasn't the Cat Burglar after all!" What was that you said about power and responsibility? But Spider-Man's attempt to catch the Cat and humiliate J.J.J (which fails) is only one of at least four subplots in the comic. 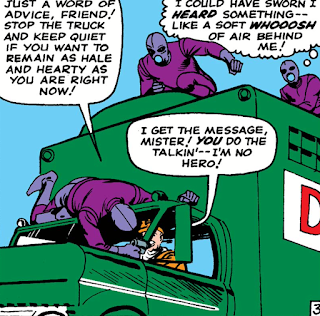 Spider-Man also encounters a group of hoods with purple suits in a van; and stops a bank robbery. Peter Parker has one final meeting with Liz, and Ned Leeds pops the question to Betty Brant. And of course, Aunt May is still very poorly. There is a lot of violence: Spider-Man hits the men in purple suits on page 3; knocks out the guy threatening his boss on page 8; scuffles with Flash Thompson on page 7, and dispatches the four bank robbers in five panels on pages 11 and 12. But the climactic confrontation with the “new foe” takes the form of a chase -- a chase which pointedly fails to come to much of a point. After Spider-Man and the Cat Burglar have run around the rooftops for a few pages, the Cat hides down a chimney and is apprehended by the police. The multiple plots keep interrupting each other and ostentatiously failing to come together. Peter rushes out of Aunt May's house because he wants to see Betty, and runs right into a gal who is coming round the corner...but it isn't Betty it’s, Liz from school. She is still trying to avoid Flash Thompson. This incident is itself interrupted when Peter Parker thinks he spots the Cat through an upstairs window, and stumbles on the murder-in-progress. It's a fun little scene, of course, but it has no bearing on the Cat, or on Betty or on Aunt May or on anything else. 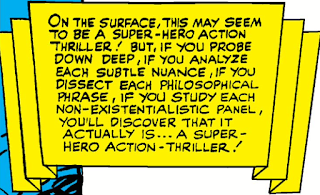 Is Ditko thinking in larger narrative units than a single issue? The guys in the purple suits and Aunt May’s fainting spells are completely unconnected this month; but they are going to become very deeply intertwined by issue #33. It may be that Steve wanted the Amazing Spider-Man to develop into a soap opera, with multiple threads getting tangled up over a multiple issues. But it is equally possible that he is trying to make an, er, existentialist point. This is what life is like. You think everything ties up neatly? Well, it doesn’t. If this issue is about anything, it is about Peter Parker's relationship with Betty Brant. We are running towards the "final chapter" and there is a sense that Ditko is tying off long-dangling plot-threads. It is a shame that the iconic final panel, in which the ghost of Spider-Man pushes the lovers apart, could not have been the last word on Peter and Betty's relationship. It’s worth comparing this breakup scene with the reconciliation scene back in Amazing Spider-Man #22. That scene was told over four panels, with the “camera” held at a consistent distance — we get a waist-up view of Peter and Betty in panel 1, full length shots in 3 and 4, and a simple portrait of Betty in panel 3. Emotion was conveyed by simple body language — Betty hanging her head in panel 2 and smiling demurely in panel 3. What difference does it make to me. Peter is behaving appallingly. Since Bennet died, he has known that Betty will never accept him as Spider-Man, but he has continued to passively date her -- or at least flirt with her in the office. He knows that Betty and Spider-Man are mutually exclusive; but he somehow thinks the situation will magically resolve itself. When he thought he had lost his powers (in The Sinister Six) almost his first reaction was that he could now marry Betty; and when he was ready to give up his double life (in The End of Spider-Man) settling down with Betty and making a life as a scientist was one of the attractions. He cannot accept that Destiny -- Mr Stan Lee -- will force him to remain Spider-Man forever. At some level he still thinks that being Spider-Man is a phase he will grow out of. Nothing can excuse Peter’s mean-spirited rants. But Betty can’t have it both ways either — she can’t say that she wants a safe, stay-at-home guy with slippers and a pipe and in the same breath proclaim undying love for her great big hunky crime photographer. And the silly woman waits until after he has slammed the door in her face to tell him the she loves him. It’s sad. When they were just two kids laughing about grouchy Mr Jameson behind the desk they seemed so happy. But she can’t overcome her wholly irrational dislike of Spider-Man and he can’t just come out and tell her the truth. I'd like to give both of them a bloody good slap. On the splash page, Stan Lee talks about Peter Parker being “beset with the same old problems”. As we come to the end of the Lee-Ditko era, I fear that the Lee-Romita Spider-Man is beginning to show his irritating face. This is the received Peter Parker, the Peter Parker of the movies and the cartoons, the angsty Peter Parker who walks the streets with his hands in his pockets, vaguely blaming the universe for whatever harm he has inflicted on himself this month. Superheroes with super-problems, as the fellow said. Yes, Peter. A bad thing has happened. But it is the bad thing you have been setting yourself up for, every day, for months. You can't bring yourself to tell even a white lie to your Auntie but you are happy to tell the most blatant lies to the girl you think you love, every day, for years. You could have told her you were Spider-Man. You chose not to. So go ahead and tell yourself that every day is like this due to some metaphysical entity called "the Parker luck." "Sure I've had my share of bad breaks!" said Peter back in issue #18 "Who hasn't? But I've been wasting too much time in self-pity!! Well, I'm done with that from now on!" This issue contains one of the worst acts of sabotage Stan Lee ever perpetrated against a collaborator. However, in the current issue Stan Lee believes that the Purple Minions work for the Cat Burglar rather than the Master Planner. "Only the cat could have thought up a scheme like this!" they say, as they steal uranium from a moving vehicle. Stan has not remotely understood what is going on: the whole point of the Cat is that he is a skilled, but otherwise unimportant “second storey man”. The idea that he’d have secret agents stealing nuclear material from Iron Man is obviously bonkers. ...as if he thinks that either the Cat or the Master Planner is one of the goons carrying out the uranium heist. This is not a slip of the pen, like calling Liz Allan “Liz Hilton” or renaming Peter Parker “Peter Palmer” or saying that MJ is Mrs Watson's daughter when she is actually her niece. It represents Stan Lee completely misunderstanding what is going on in the story. In issue #29, J.J.J asks Foswell to find out about a series of scientific robberies in the city; in #30, the Purple Minions appear for the first time; in #31 we discover that they work for the Master Planner; and in #32 we find out who the Master Planner is. (Clue: Doctor Octopus.) It's a lovely way to roll out a big story event, and Stan Lee has ruined it. All of which raises a further question. The Master Planner and the Cat Burglar are accurately foreshadowed (as two separate characters) in issue #29, but Lee has no idea what is meant to be going on in issue #30. Doesn't this suggest that communication between Lee and Ditko only irretrievably broke down after Never Step on a Scorpion was completed. (say, in May 1965). 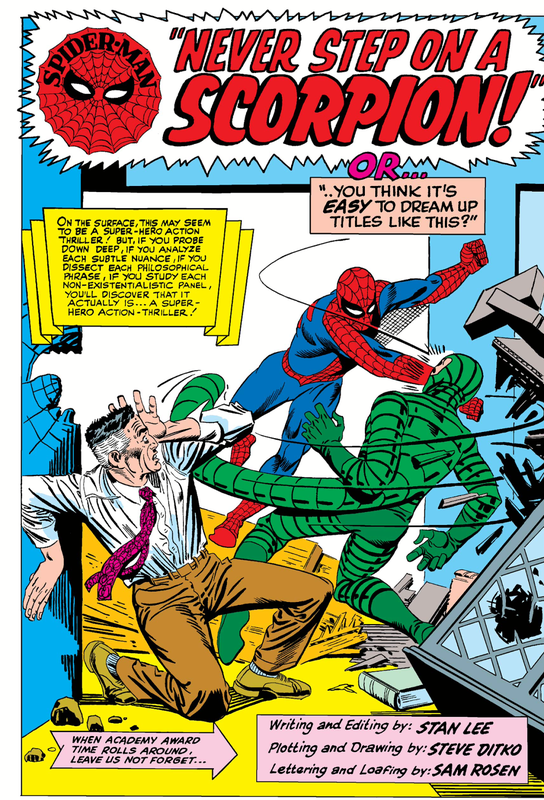 It would follow that the so-called Master Planner trilogy is our first specimen of what the Amazing Spider-Man would be like if it was created by Steve Ditko without input from Stan Lee. And, by an astonishing coincidence, those three episode are universally regarded as three of the very greatest comic books of all time. Mrs Watson invites Aunt May to go to the movies “tonight”. “Minutes later” Spider-Man is out web-swinging, and fails to see the Cat Burglar. The Cat Burglar is using a flashlight. J.J.J returns to his apartment “later” and calls the police; “at that very moment” Spider-Man encounters the Master Planner’s men. He hears that J.J.J has issued a reward and goes to taunt the publisher personally. He then returns to Aunt May’s house. Peter Parker goes looking for Betty “after a good night's sleep”. Aunt May specifically says he has started early. He runs into Liz (who is on her way to work). Ned is visiting Betty again; he is late for work but she is not going in until the afternoon. Peter must arrive almost as soon as Ned leaves (the phone is ringing as Ned walks through the door). The Cat says that it is “getting dark” on page 14, so a whole day has passed between Peter visiting Betty and him leaving the house as Spider-Man. Betty said that she was going into work for the afternoon, but she clearly phones Peter from her apartment (note the table lamp) so she must have worked from around 1AM to around 6PM and returned home. 0900-1700 -- Ned at Bugle? 1300-1700 -- Betty at Bugle? 1000-1800 -- Peter wandering streets feeling sorry for himself, and stops bank robbery. 2130 -- Siege and capture of Cat. Stan Lee simply tells us that Peter Parker takes the “newly developed” photos to J. Jonah Jameson “later”. However, he could hardly return to Forest Hills, develop and print the pictures, and get back to Manhattan in less than two hours, which would make it well after midnight. We know that Betty worked at the Bugle in the afternoon and returned home in the early evening. And it is clear that she is wearing different clothes in the final frames. So I think the final frames take place early the following morning. 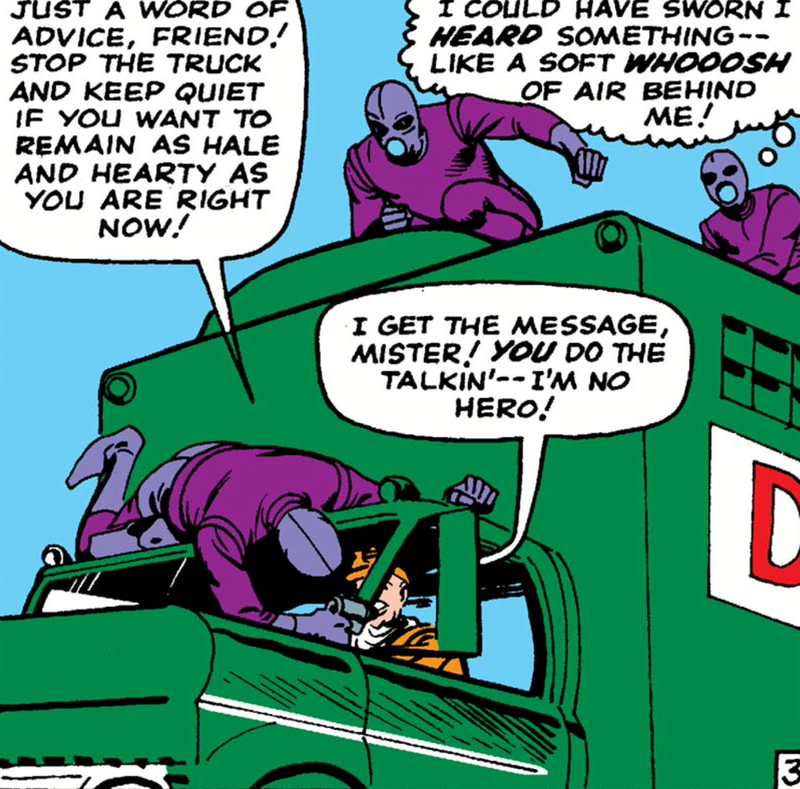 There is no reason why this should not be the same day as Spider-Man's second meeting with the Purple Minions at the beginning of issue #31. Next issue, Spider-Man will encounter the Master Planner's men again, and register for college the following day. If Empire State University is the same as New York University, then freshmen classes start in the final week of August. Evening: Cat robs Jameson, Purple guys rob the van. Morning: Betty and Peter have a row. Afternoon: Peter mooches round feeling sorry for himself. Aunt May sick; Classes begin. Where do we go when we watch Star Wars? We know where we go when we watch Doctor Who. No such place ever actually existed, but everyone claims to have been there. It was a very long time ago: everything was black and white. We were very small: small enough to fit into the interstices between walls and furniture. TVs were very big. Pieces of furniture in shared family spaces, not electronic toys in our private rooms. “Putting on the TV” was a positive choice. The pictures were both real and not real. We wanted to look at them and hide from them at the same time. Middle-class. Suburban. Domestic. Ubiquitous. Safe. Modern Doctor Who has written about that space almost obsessively, but it has never remotely taken us there. Yoda voice: That is why it fails. There are AT-AT Walkers: new AT-AT Walkers that walk on their knuckles and something in the background that might be a floating galleon but might only be an Imperial Shuttle. The Walkers arrived in Empire Strikes Back. They were a replacement for the Death Star. Never quite as magical. But magical just the same. There are white alien goats on a snowy background. I suppose if there are Walkers there has to be Snow. First films have Sand and Second films have Snow. The third film will go back to Jakku, you mark my words. The Millennium Falcon is being chased through a fiery red cave by TIE Fighters; which makes us think of the wrecked Star Destroyer from part VII and the Death Star superstructure from part VI and the space worm from part V and coming out of hyperspace near Alderaan in part IV. This will come very near the beginning of the film, as a warm up, to tell us that Star Wars has started again and the toys are all intact. There is battle with big space ships and TIE fighters and X-Wings and a stirring speech about lighting the flame that will become the spark that will burn the fascists down although we all know that the fascists won’t burn down until the last ten minutes of Episode IX. There is Po Dameron looking resolute and Finn fighting the shiny gold lady Stormtrooper officer with a a big glowy laser-chainsaw. This will happen at the end. Po and Finn will be blowing things up resolutely while the Proper Plot happens somewhere else. We always knew that this moment would come. Not when he lit the torch at his Father funeral pyre but from the very first moment in the cave. I-was-once-a-Jedi-knight-the-same-as-your-father. 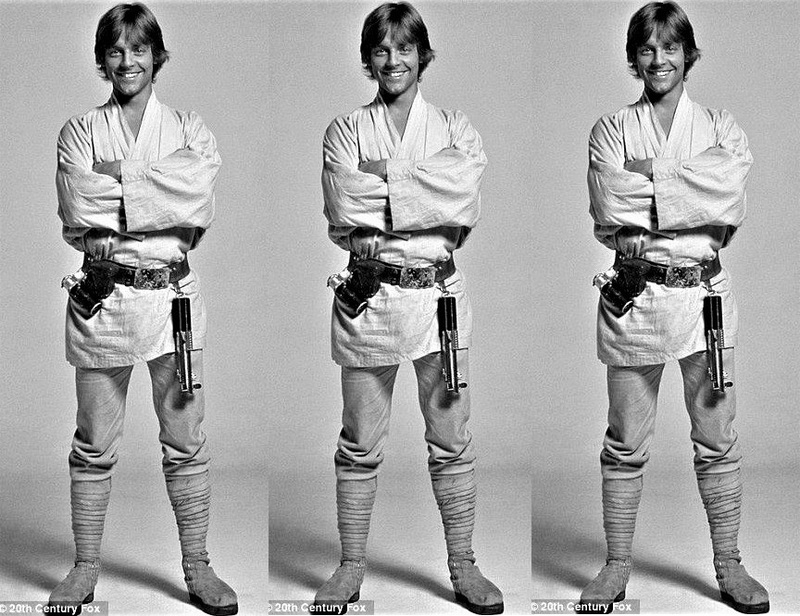 There would always come a moment when stroppy James Dean teenage Luke Skywalker would be old. We need him to be old because we need him to be a Jedi Knight and Jedi Knights are old. Alec Guinness is the only and all Jedi Knights just as happens Leonard Nimoy is the only and all Vulcans. The moment we imagined, when Luke Skywalker is a Jedi like Obi Wan and he is teaching other Jedi (including me, me, please, including me) — the moment when the Jedi actually Returned — has already happened and is already over, somewhere in the space between VI and VII. I suppose we should never see it, in the same way we should never have seen the Old Republic, because Luke Skywalker and the New Order of Jedi, is part of the happy-ever-after which was implied during the fireworks and the Ewoks. And it was not a happy ending. Of course it wasn’t a happy ending because everyone living happily ever after is how a story ends and there have to be more stories. So we get to see old Luke, but we don’t get to see Jedi Luke. We get to see Luke the Last Jedi. Episode VII finishes with Rey holding Luke’s lightsaber out to Luke, and us not knowing is Luke takes it or not. (Spoiler: No.) The Trailer finishes with Ren holding his hand out to Rey and us not knowing if she takes it or not. And that makes us think of Daddy Vader holding his hand out to Luke, which is why Great Big Hologram Leader Guy (who has got smaller) bellows “FULL…FILL…YOUR…DES…TIN…EE” in the trailer. (He is probably saying it to Kylo Ren, but he could just as well be saying it to Rey. Of course he might not say it at all. That sometimes happens with trailers.) This will happen in the middle of the movie. Rey will face a difficult time in her training when she is tempted by the Dark Side. Maybe she will break off her Jedi training with Luke because she sees a vision of Kylo torturing Po and Finn. Maybe when she is on the point of turning to the Dark Side, Ren will say "No, Rey, I am your half-brother." Maybe he will kill his Mum and go totally over to the Dark Side. Maybe he will not kill her an come back to the light. Maybe the Millennium Falcon will come over the hill at the last possible moment. One thinks of Locutus of Borg, possibly. Luke says “I’VE SEEN RAW STRENGTH LIKE THIS ONLY ONCE BEFORE IT DIDN’T SCARE ME ENOUGH THEN IT DOES NOW” and Big Hologram Gollum Guy says “When I found you I saw RAW UNTAMED POWER”. I suppose Luke is talking to Rey about Kylo Ren and I suppose Snoke is talking to Kylo Ren about Ben Solo. I suppose Luke is going to refuse to train Rey in case he buggers it up and sends her to the Dark Side as well. Which will send Rey into the arms of Ren for help. Which will result in Ren’s ultimate redemption. Or else something completely different will happen. To summarize: Rey and Ren are powerful Jedi and are going to be tempted in various ways and there is going to be a battle involving X-Wings and capital ships and walkers and a chase involving the Millennium Falcon. A flea-pit olden days 1970s cinema with fizzy orange juice and ice-cream. Or maybe some nuts. Or a big London movie house with posters and programmes and people selling knock-off merchandise outside? Or am I misremembering? Was Star Wars always something that we were watching again on DVD. Or VHS. Or just ITV? The movie called Star Wars (there is only one movie called Star Wars) was great, and we have all seen it forty or fifty times and will see it another twenty, thirty forty times before we die. (I have measured out my life in coffee spoons.) 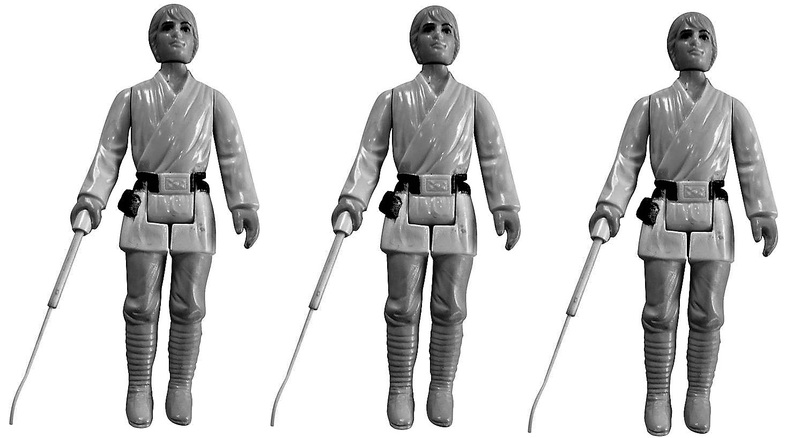 But before there was a movie called Star Wars there were Star Wars toys. 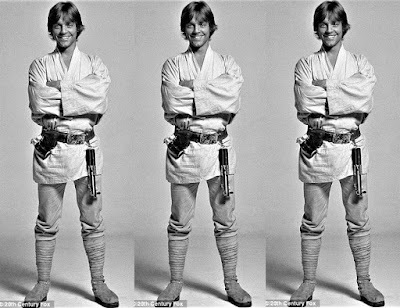 The original dolls were almost comically badly done: no-one even tried to model Mark Hamil’s face and the white plastic smock molded onto his body has only the most passing connection to the greying desert gear he wears in the movie. I almost wonder if the appeal of the figures wasn’t in the packaging: the shiny card with the Star Wars logo and a big colour picture of the iconic twin suns scene printed on it? The closet you could get to putting your hands on a bit of the film and keeping it? No-one could afford to buy them, obviously. We went on pilgrimages to toy shops to gaze at them enviously. Isn’t that what the word “iconic” literally means? 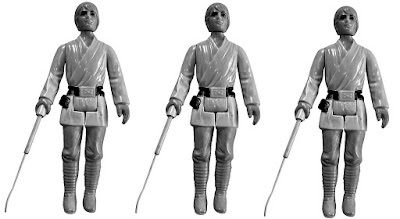 The idea of Luke Skywalker, the blond guy in white with a utility belt and glowy sword can somehow be contracted to three inches of barely articulated plastic and have endless battles with the idea of Darth Vader, a black masked villain with a cheap cellophane cape. How many millions of battles did Luke Skywalker have with Darth Vader on how many thousands of bedroom floors between 1977 and 1980? At least until their lightsabers snapped off. We can't watch Doctor Who again. We wouldn't physically fit behind that damn sofa. But perhaps we can crouch down on the bedroom floor one last time. There can't ever really be a new Star Wars story, and we wouldn't want there to be. (George Lucas never really understood this.) But we can take the Lego minifigs out of the box and play out our favorite scenes in a slightly different order. I'm pretty sure Joseph Campbell said that. ...The snowflakes trying to obliterate the parts of history that they don't like. ....Pathetic - you can't erase history, you should learn from it and make sure it never happens again....And the Colston Hall will AlWAYS be the Colston Hall to me because it's part of my history! ''''Edward Colston did not start slavery. It was started by African tribes capturing and selling other Africans. .....The PC Brigade win again. Pity some people have no guts to stick it out. ....but Colston Girls School has decided to leave the name as it is. ....Changing a name and trying to airbrush history is easy, righting modern day wrongs and the suffering of those currently living is much harder. ....Fantastic news!!! the Lefty in charge of the Colston Hall is still pressing ahead though, forcing their will on us like any true Libtard! ....Excellent news - should not be hiding the past - all this politically correct nonsense is highly frustrating. Colston Hall take note !! J. Jonah Jameson, Frederick Foswell, Betty Brant, Ned Leeds, Aunt May. Spider-Man makes web bolas to entangle the Scorpion. Buying new clothes for college “practically cleans him out”. A suit would cost about $25 and a shirt about $3, so he can hardly have blown more than $50. He has spent through the $1,000 the Globe paid him in #27 in about 2 months. Peter Parker graduated in issue #28, so that story almost certainly took place on June 25, 1965. Peter Parker starts college in issue #31, so that story almost certainly takes place between 23 - 27 August 1965. Amazing Spider-Man #29, #30 and #31 must be consecutive: Betty Brant gets an attack of the vapours in #29 and is still in bed in #30; Aunt May feels unwell in #29 and is hospitalized in #31. It follows that this issue takes place a few days before Peter starts college, say 20 Aug 1965; and that there has been a two month gap between the end of Spider-Man #28 and the opening of Spider-Man #29. This is consistent with Liz not having seen Peter “since graduation” in #30, and Peter not having seen Betty “for a long time” in #29. It also allows Ned and Betty a few Peter-free weeks to get to know each other. The events of issue #28 comfortably take place in a few hours. Page 2 "Last year's clothes are getting too tight on me!" Guys can grow and inch or two between age 16 and 18, and Peter Parker is perpetually working out and presumably gaining muscle mass, so it's not surprising he needs new clothes. He withdraws some cash to go shopping with; but then changes his mind and goes to the Bugle instead. That said, I find these panels baffling. Peter is generally shown wearing a blue suit, yellow waistcoat and red tie. From this issue he will largely abandon the jacket and tie and wear a much less formal non-buttoning yellow vest. It would not surprising for Ditko to flag this change of look with a trip to the shops. But Peter is clearly already wearing the new waistcoat in panel 2; and he doesn't get to the shops because they are too crowded. This is no Lee/Ditko miscommunication: the text accurately reflects the pictures -- Peter struggling to fit into a shirt, Peter going to the bank; Peter walking away from the crowded shops. But Peter definitely wears a new outfit from this point on. Page 2 "I outsmarted them by pretending to crack up! They returned my costume to me in order to calm me down!" Does Stan Lee think that the Scorpion's powers come from his suit? Or has he spotted a problem in Ditko's pictures (why on earth does the Scorpion have his costume on when he escapes from jail?) and hastily come up with an explanation? Is there an ironic contrast between the Scorpion getting his costume back and Peter Parker entirely failing to buy a new waistcoat? We know from Amazing Spider-Man Annual #1 that it was common practice to allow super-criminals to wear their costumes in jail. Betty last appeared in issue #26. Nine issues ago, Ned stated that he was going away for 6 months. Golden Boy was a musical which ran on Broadway from 1964-65, starring Sammy Davies Jnr, about a boxer who accidentally kills an opponent and commits suicide. A respite is temporary by definition. Page 9 "As for you, Scorpy, we've just got to get rid of your deep rooted-hostility complex." A "hostility complex" isn't really a thing: psychologists do occasionally refer to someone having an "anger-hostility complex". Like "non-existentialist", it's a five buck word that doesn't really mean anything: Lee/Parker thinks that sticking the word "complex" on the end of another word makes him sound clever. Peter is a bookworm, but pretty ignorant about the humanities. Lee and/or Peter Parker has forgotten that Spider-Man started life as a TV entertainer. Indeed, his agent originally promised to get him a slot on the Ed Sullivan show. “This will hurt me more than it will hurt you” is proverbially said by a father or school-teacher to indicate that they are administering corporal punishment only reluctantly. Considering the way Aunt May scolds the adult Peter Parker in #22 and #25, it is quite possible that he heard the phrase from her once or twice when he was smaller. He isn’t paraphrasing the proverb (saying the same thing in different words) so much as reversing or parodying it. P18 "I've got him now! He can't hold his breath as long as I can!" Why not? The Scorpion is meant to be Spidey's physical equal, and Spidey has never had a specific breath-holding power before. 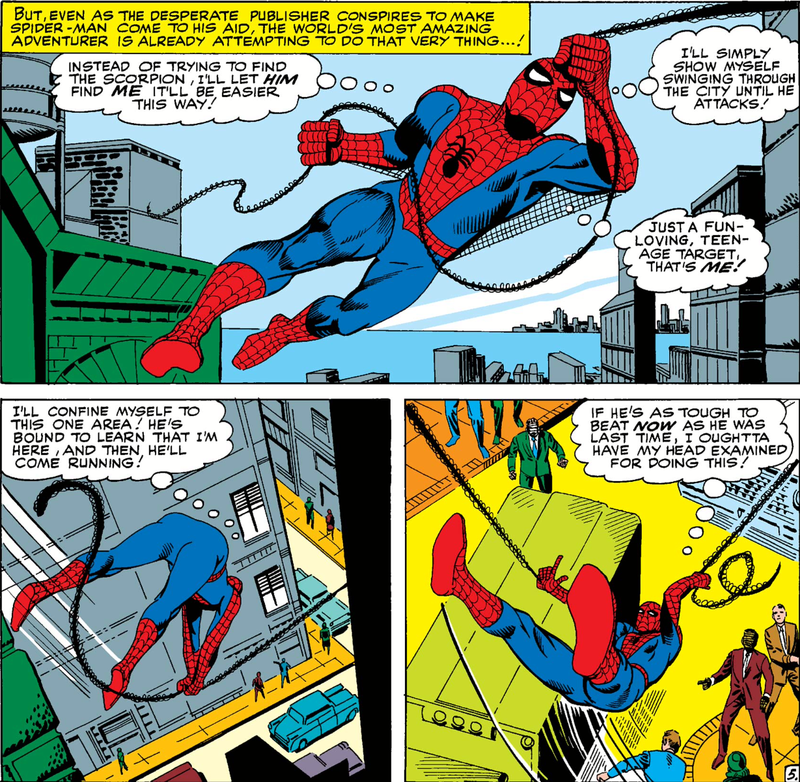 Ditko's pictures simply show Spider-Man knocking the Scorpion out with a punch: the breath-holding idea is added in the text, presumably because Stan Lee thought Spider-Man's victory required more explanation. This comic reminds us of just how good Stan and Steve could be when they were working together. No: let’s try that again. This issue shows us just how good Stan and Steve could be when they were banging their heads together, pulling a story in two different directions, openly at war with each other in the pages of their own comic book. This book has "creative tension" written all over it. And it's great. You need look no further than the first page to see what is going on. Steve Ditko opened last issue with a nice little school scene in which Principal Davies reassured Peter that he wasn’t mad at him after all; and Stan Lee poked fun at it. We can discuss the precise position of his tongue relative to his cheek, but fun at it he unquestionable poked. Is this any way to begin a superhero thriller? And so this issue Steve strikes back. This story actually begins with a jail break. The first panel could perfectly well have been the Scorpion bursting through the prison wall. But no: Steve opens the comic with Peter Parker in his bedroom putting on a shirt. And then he goes shopping. This dramatic enough for, you, Stan? Has the impact of a falling feather, does it? 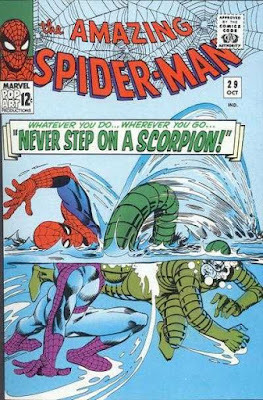 The splash page points out that Stan – Stan Lee, me, me, me – came up with the title, Never Step On a Scorpion and was very, very clever to have done so. It also chastises uppity plotter-artists who think that comic books are about something. Because they’re totally not. This may look like a superhero comic. 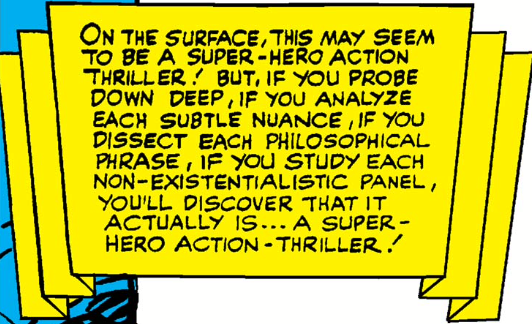 But if you study it carefully, you’ll find out that it really is only a superhero comic. On the other hand, this issue is a bit of a counterpoint to our working hypothesis that Stan and Steve haven't been on speaking terms since issue #23 or thereabouts. Maybe they haven't. But if so, isn't it rather surprising that J Jonah Jameson so specifically asks Frederick Foswell about next month’s baddie (that Cat Burglar) and the month after next’s baddie (the very famous Master Planner)? How did heroic writer Stan know what homeric scripter Steve had lined up for issue #30 if they weren't talking to each other? I suppose it is just possible that Stan Lee plucked “Cat Burglar” and “science thief” out of thin air because J.J.J had to be saying something, and Ditko saw the copy and said “Cat Burglar, is it? Then I’ll damn well give you a Cat Burglar, see if I don’t.” But I think there must have been some kind of conference, if only through an intermediary in which Steve said “I think next month I’m going to do a Cat Burglar” and Stan said “Sure, Steve, I’ll foreshadow, shall I?” or Stan said "What about a story about a villain stealing scientific equipment?" and Steve said "Yeah, I can run with that idea." 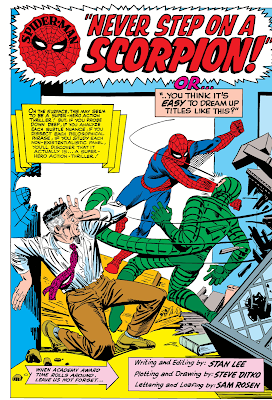 And if Ditko thought that a story was a skein of multiple threads that eventually tangled themselves into one big narrative knot, while Lee thought that a story was a kind of prelude which set up the fight scene then this issue is as pure a Stan Lee plot as was ever been committed to low grade pulp newsprint. Nine page set up; nine page fight scene (with a bit of an interlude at half-time) two page wind down. The Scorpion gets out of jail; the Scorpion wants to kill J. Jonah Jameson; so Spider-Man has to defend J. Jonah Jameson — even though Jonah created the Scorpion to kill him. Gosh! How ironic! There is a little bit of waffle in which Jameson tries to goad Spider-Man into fighting the Scorpion (which he was obviously going to do anyway) and Spider-Man swings around the city trying to draw the Scorpion out (which leaves the Scorpion free to attack an unprotected Jameson), but basically “The Scorpion tries to kill J.J.J and Spider-Man tries to stop him” is as sophisticated as it gets. The Scorpion gets to the Bugle first and menaces J.J.J; Spider-Man arrives in the nick of time; they bash each other all round the office, then over the rooftops, and finally in the river. Spider-Man wins the day because he can hold his breath underwater for longer than the Scorpion can. (It’s okay for your ordinary decent superhero to half drown opponents, apparently.) J. Jonah Jameson claims that he defeated the Scorpion single handedly; Betty Brant goes into shock and is taken care of by her new boyfriend; and Aunt May has an attack of Aunt May disease but doesn’t tell Peter so as not to worry him. The end. Artistically, Steve is at the top of his game, which is a pretty impressive place to be. The web swinging sequence on page 5 is one of the most perfect things he ever drew. We start up among the rooftops, on Spider-Man’s level; we swoop down to ground level with him; and end up on the sidewalk with the crowd, looking at Spider-Man swinging above us. We see him in mid-swing; then diving at the ground, and then swinging up again with the momentum, shooting a new web from his left hand as he does so. (And then we pull back, so we are watching the Scorpion watching Spider-Man.) If you want to understand how Spider-Man moves, this is the page to study. The fight scene has an energy which the punch up with Molten Man was desperately lacking. Look at Spider-Man simultaneously falling and punching the Scorpion in panel 3 of page 9: neither of them appears to have a foot on the ground, but both of them are accidentally kicking J.J.J. whose limbs are flailing wildly. The pacing is perfect; we see the Scorpion chasing Jonah round the Daily Bugle building, and then cornering him against a well; at which moment Spider-Man swings in through the window. There is a neat one page interlude between Spider-Man and the Scorpion leaving the building and the fight resuming on the roof, in which Jonah surveys the wreckage of his office and realizes he can make a profit on the insurance. But this is not a one man show. Stan Lee’s dialogue lifts a very good fight scene to a whole nother level. It is true that there are a lot of speech bubbles, and quite a lot of captions and it is true that not all of these speech bubbles are strictly necessary. If you are inclined to regard comic books as things that you look at rather than read than five speech bubbles on a single panel maybe be overdoing it a bit. But I submit that Stan Lee knows exactly what he is doing. The panels are crowded with dialogue; but J.J.Js offices are crowded with people. There is slightly too much to read; but Spider-Man feels that J.J.J and Ned and Jonah and Betty are all shouting at him, and he wishes they would keep it down and let him concentrate on the fight. Everyone has their own voice. The Scorpion sounds like a proper Republic Serial villain: “This is only a temporary respite! I’ll dispose of Spider-Man and then we’ll continue where we left off.” Ned Leeds is continually, infuriatingly, chivalrous “Don’t worry Betty. I’ll see that nothing happens to you.” Jameson is moronic, sell-centred, cowardly and very funny. “No! You can’t get me! Get Spider-Man instead!” And Spider-Man, of course, is an endless stream of sarcasm. Jameson: It’s Spider-Man’s job to fight killers like you! Scorpion: Well, if he knows what’s good for him he’ll resign, real quick! Spider: If I knew what was good for me, I wouldn’t be here in the first place, mister! I recently read through a couple of issues of Captain Atom, the comic Ditko did for DC after leaving Marvel in '66. The pictures are as pretty as ever, but I find the comic practically unreadable. Speech bubbles and captions have hardly evolved beyond silent movie intertitles or Rupert Bear rhyming couplets. When the villain appears, he says “I expected to meet you Captain Atom, but not this soon.” When the villain punches him, Captain A says “Just have to take the blows so they won’t suspect I have my powers back.” When he returns to HQ he says “Where is the general. I freed myself so he doesn’t have to pay the ransom.” Everyone sounds just like everyone else. These are not illuminations or embellishments: merely stage directions. Stan Lee really was taking comic book writing into places it hadn't been before. Look at the first panel on page 12. We are following through on a punch. 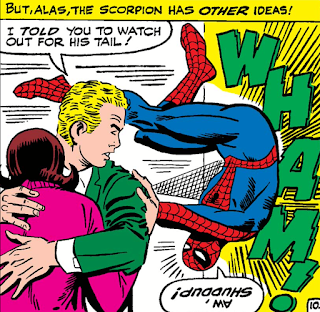 The previous panel showed the Scorpion hitting Spider-Man; this panel shows him flying through the air, past J.J.J and into a bookcase. If we were scripting the panel Captain Atom style, we wouldn't need anything more than “The Scorpion hit me pretty hard!” or “Look, the Scorpion has knocked Spider-Man into that piece of furniture!” or, simply “Ouch”. (Settle down at the back. It means “tramp”.) He puts Spider-Man’s reaction to Jonah's reaction into the same panel. A panel which by itself “means” one thing — “Spider-Man has been thrown across the room” — has had two additional “meanings” inscribed into it — Jameson is nasty (and Spider-Man gives as good as he gets); Jameson is a skinflint. 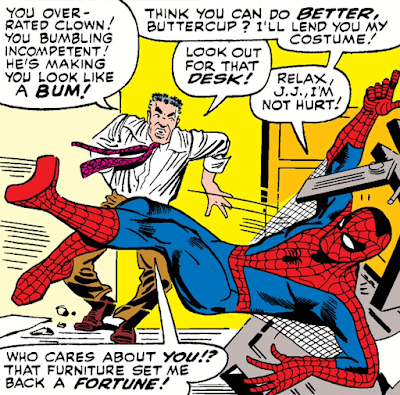 I don’t think Jameson’s concern about the cost of his office furniture — or his plan to claim on the insurance — is implicit in any of the artwork, although Ditko sure does show a lot of stuff getting broken. Stan Lee's text does not merely draw out what is in the pictures; it adds new elements. This episode does have a structural purpose in the overall story arc: it transforms Ned Leeds from a plot device into an actual character. When Leeds first appeared he was little more than a stick to hit Peter Parker over the head with. When our hero was at his lowest ebb, he happened to see Betty Brant having a pleasant evening out with a charming, good looking journalist. Ned was almost immediately written out — dispatched to Europe to cover the nuclear non-proliferation treaty in #20. Since he learned that Betty has been corresponding with Ned in issue #23, Peter Parker has been incredibly jealous of him. This is a bit of a role-reversal -- from issue #13 to #22, pretty much Betty Brant's whole personality was reducible to "the jealous one". It is also typically unfair and sexist of Peter: he has openly dated Liz Allan, and specifically told Betty that he was okay with her seeing Ned. But this is the first time Ned has really appeared as a character. And it’s a skillful piece of characterization. He does nothing but nice things — he laughs at Peter’s weak jokes, he comforts Betty during the fight and takes her to the doctor when it all gets a bit much. But by the end of the episode both we and Spider-Man are sick to death of the great big goody two-shoes. Which is an important set up for next issue's Not Particularly Surprising twist. On page 10, we see Ned hugging Betty (in a brotherly, comforting sort of way) while calling out “Hurry, Spider-Man…you’ve got to stop the Scorpion. I’ll look after Miss Brant…You concentrate on your fight…and watch out for that tail of his.” This, of course, antagonizes Spider-Man ("first he muscles in on my girl, and now he’s giving me advise on how to protect myself.”) He rushes in to attack the Scorpion (who isn’t even in panel) and is immediately thrown back against the wall with a dramatic Wham! “I told you to watch out for his tail!” says Ned. Lee spots that “Shuddup” is funnier than “Shut up” and “Aw shuddup” is funnier still. The icing on the gag is that the balloon is printed upside down. It’s the most perfectly judged moment in one of the most perfectly judged of all Spider-Man stories. It may appear to be about Spider-Man fighting the Scorpion. But if you study it more closely, and analyze ever panel and nuance etc etc etc it’s actually about J.J.J and Ned Leeds watching Spider-Man fight the Scorpion; or, in fact, about Spider-Man reacting to being watched by Ned and Jonah. The Sinister Six may be the perfect example of a Stan Lee's vision of Spider-Man, and next month's Cat Burglar may be the perfect example of Steve Ditko's. But Never Step on a Scorpion is the perfect example of what the two men could produce when they were in sync — or creatively out of sync. Light, funny, witty, with a sting in the tale: this is my Spider-Man.